There are cruel fight scenes in many games but what are your favorites. 300 March to Glory has some cool sword action, heads flying in the air but graphics are like cartoon. God of war is a violence classic but an angry guy turning around him like Tanzanian monster smaller than pinky finger and killing huge monsters is a little childish but cool. 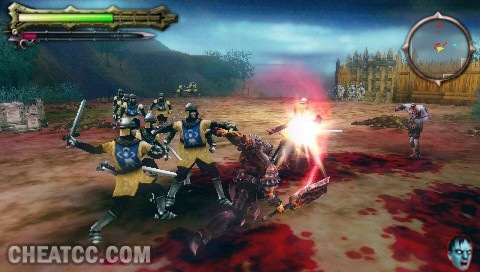 Wow brought me back Gladiator Begins was the first game I played on my PSP nice blood. It's fighting mechanism is unique too afaik dropping weapon taking back from ground to the hand you choose numerous combos this game is awesome. Why nobody informed me about Undead Knights till now. With its metal music, lake of blood and ability to turn enemies into ally zombies this game rocks baby. It remind me 80s horror movies.